Background. 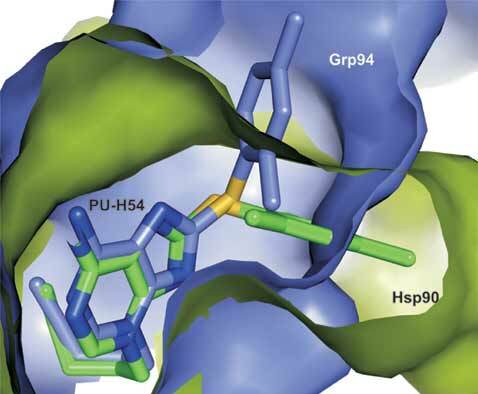 The high sequence and structural homology among the hsp90 paralogs – Hsp90α, Hsp90β, Grp94, and Trap-1 – has made the development of paralog-specific inhibitors a challenging proposition. Objective. This review surveys the state of developments in structural analysis, compound screening, and structure-based design that have been brought to bear on this problem. Results. First generation compounds that selectively bind to Hsp90, Grp94, or Trap-1 have been identified. Conclusion. With the proof of principle firmly established, the prospects for further progress are bright. Hsp90, Grp94, Trap-1, Paralog-selective inhibitor, Structure-based design, Screening. Hauptman-Woodward Medical Research Institute, 700 Ellicott Street, Buffalo, NY, 14203, USA.